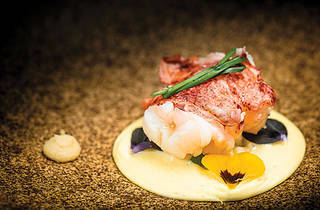 Heralded chef Akrame Benallal has caused a stir in the culinary world over the past few years. The Ferran Adrià and Pierre Gagnaire alum opened his first Restaurant Akrame in Paris in 2011 and quickly smashed Michelin Guide conventions as it was awarded a star within a year. Benallal, who also opened L’Atelier Vivanda in the French capital, hit the headlines, won himself international acclaim and then set his sights on global success. So, for his second eponymously titled restaurant, he chose – lucky for us – Hong Kong. Wan Chai’s chic Ship Street, to be precise, which already boasts the Michelin-starred Bo Innovation and the popular 22 Ships. Restaurant Akrame number two has just opened and, as we venture out, we’re nervous for Benallal. There’s much expectation here. Our nerves, however, are instantly relaxed upon entering the restaurant. Benallal is known for his bold style and innovative marriages of flavours – and the décor at Akrame reflects the chef’s ethos. It’s all bold and eclectic, with a touch of French flair. Mirroring the interiors of its Parisian sister, the Hong Kong spot sports a mix of stark black and bare concrete walls, balanced by warm candleholders and photos of beautiful tattooed women. So, the scene being set, we can’t wait for the food. And degustation is the rule rather than the exception here. There’s only two choices of set dinners on the menu – a four ($788) or six-courser ($998). We go the whole hog with six (not including the amuse bouche and dessert!) – and our journey begins with an exquisite parmesan cookie with vinegar-infused salmon roe. The parmesan flavours mute the fishiness of the roe while the vinegar brings out the cheese. There’s also a thin, black squid ink chip topped with a small slice of smoked eel that brings out an ocean of sensations on the tongue as the ingredients combine. Next up is a cauliflower soup. A bowl arrives containing a few Campari jellies, some broccoli flour and a scoop of hazelnut jam. Then the broth is brought to the table and poured on the ingredients. The soup, though rich in its own right, is superbly enhanced by the treasure trove of accompaniments. Broccoli is a natural pair with cauliflower – but as a freeze-dried ‘flour’ it adds texture to the liquid, with the flavour further ignited by the nuttiness of the jam. Then the jellies add a slight bitterness to the ensemble. There’s so much going on in this outstanding dish. 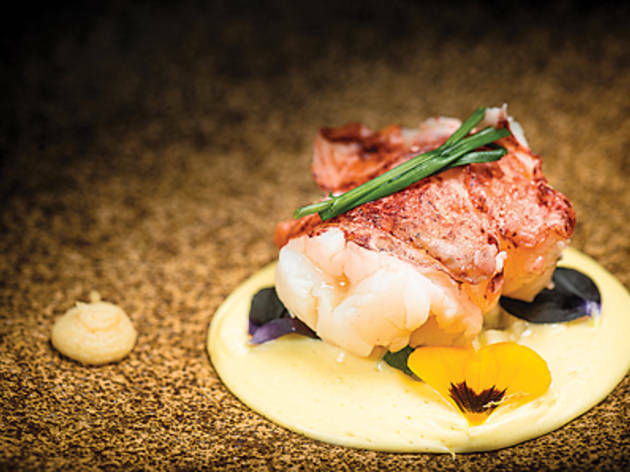 The journey continues with experimental triumphs in both flavour and texture as polar opposite ingredients work with each other on the plate and palate. Citrus, sea and earthy tones combine well in the clam in passionfruit and parsley butter sauce and parsley foam; and the oyster with salmon and olive oil roe in an onion consommé is also a hit, with a supremely creamy oyster working with the fishy roe and rich consommé. Then the layered gruyère and mushroom in mushroom consommé hits the table. Two simple ingredients thinly layered together seldom work in synchronisation as well as this. The cheese takes over the earthiness of the mushroom while the fungi cuts the slight bitterness of the gruyère, ending in an aromatic tone. Next comes the succulent lobster, which is cooked in a steaming mason jar of lobster consommé at the table and is then spooned on to a bed of lemon sabayon decorated with edible flowers. The crustacean is smooth and is complimented by the rich fluffiness of the sabayon but freshened with a lemony tang. And then the steak dish arrives – a tenderloin cut with beetroot, olive puree and a crispy fried onion garnish. It’s dusted with edible charcoal that allows for a charred taste without harming the texture of the tender meat. The ‘bonus’ dessert to finish is jet black. A complete surprise. A pan-fried pineapple is covered in a charcoal sauce with charcoal ice-cream on a black cookie. Despite the dark tone, though, the flavours combine sublimely – with the toffee tasting caramelised pineapple holding it all together before you’re hit with a strong salty back end. On the side is a rich Valrhona chocolate mousse, light in texture yet richly chocolaty, combining well with a slice of tangerine at the bottom.